Dumpster rental can be a blessing when you need one, but otherwise, who ever gives it any thought? It’s a convenience most people don’t remember until it fills a need that’s staring them in the face. It’s only then they realize they should have planned ahead and gotten some kind of waste disposal option in place. Dumpster rental comes in handy when working on a residential or commercial construction site, or even when you’re doing a remodel or big clean-out of your home or business office. To help projects like these run smoothly, it’s ideal to schedule a dumpster rental service in advance so it’s ready to go, saving you time and stress. Forever Clean makes rental extremely easy for Raleigh residents and those needing dumpsters for minor or extensive jobs throughout the Triangle area. Need a dumpster rental? Request a quote here on our site. Our team at Forever Clean knows the job you’re about to tackle is hard enough, so we want to make the waste management aspect of it as easy and stress-free as possible. Once you’ve requested a quote on our site, a member of our skilled team will be in touch with you to discuss your needs. We’ll help you gauge what size of dumpster your project will require, as well as how many. Then, we’ll promptly drop off the requested dumpsters at your listed site at your scheduled time. When you’ve filled the dumpsters, our team will pick them up. If your dumpster rental is just a one-time need, we’ll pick up your rentals on the pick-up date your provide. If your needs are ongoing, like in the case of a construction site, we’ll set up a recurring pick-up and dumpster replacement schedule with you. That’s dumpster rental made easy. 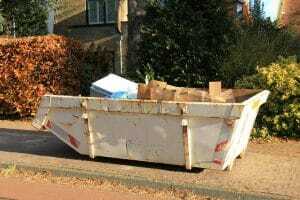 If you’ve never rented a dumpster before, it can be intimidating to figure out your needs upfront. Our team can help with that. We provide two dumpster sizes, and our staff can help you determine which you’ll need and how many of each your job will require. Don’t wait until your project day has come before realizing you need to schedule a dumpster rental service. Forever Clean makes it too easy not to be prepared. Make your project run smoothly with prompt, convenient, responsive help from our experienced experts at Forever Clean. To get started with scheduling a rental, call us at (919) 680-1818 or go here to request a quote. Copyright 2019 Forever Clean. All Rights Reserved.